Coral Beach Hotel i Mirissa, Sri Lanka: Reservér nu! 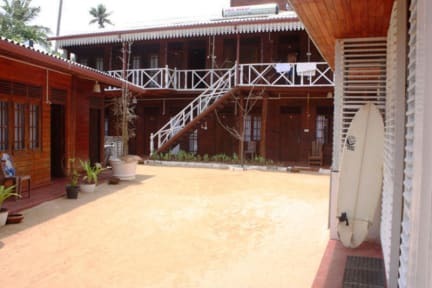 Located in the surfing hot spot Mirissa, Coral Beach Hotel provides the famous southern hospitality in a sea side location. From this Mirissa hotel, guests can enjoy sea baths and warm soft beaches. 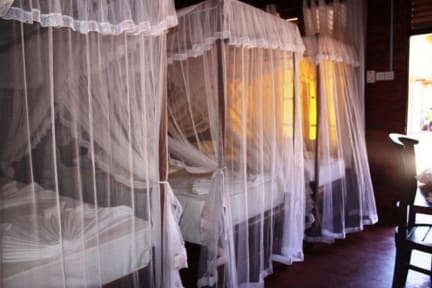 The 15 rooms are available as air conditioned with individual controls and non air conditioned. Wi-Fi, telephones and email are just some of the facilities guests can enjoy. The attached bathrooms have hot and cold water and other amenities. Guests can enjoy around the clock room service, while the in-room safe makes sure valuables are secure. The Coral Beach hotel has a restaurant that specialized in seafood prepared according eastern or western tastes which guests can eat while watching the surfers at play. Reasonably priced drinks and cocktails are also available. Mirissa is the ideal location to enjoy hours of snorkeling and surfing. The beach area is gorgeous which is why visitors tend to spend hours simply sunbathing on the sand soaking up the sun. Diving equipment is easy to hire in the area so even novices can try their hand at diving. From Mirissa guests can travel towards the Galle historic city with its quaint walkways and shops. With a little further travel guests could experience the wildlife of the Yala National Park.